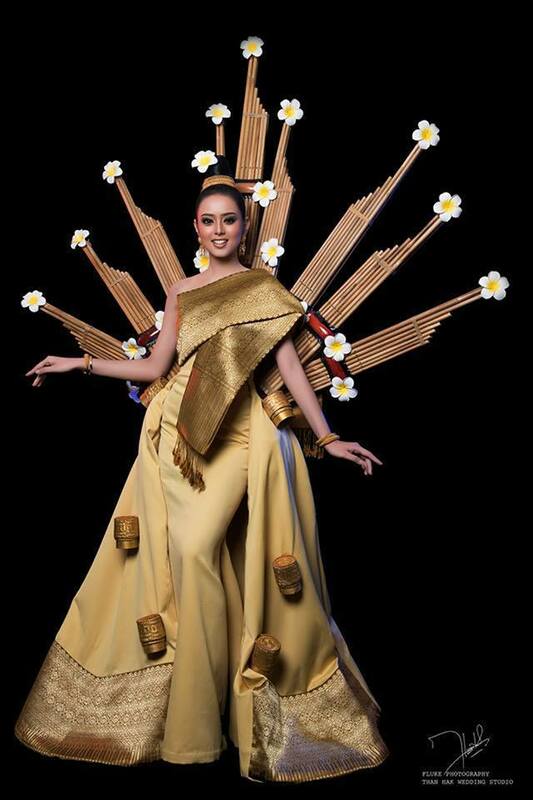 Combining elements of Lao culture into a dress is certainly a challenging undertaking. One that the costume designer has taken to heart in a more literal fashion. Can you spot all the elements? Dok champa flowers - considered to be the national flower. Khene instrument - a traditional musical wind instrument usually made from bamboo. Sticky rice baskets - as sticky rice is a national food staple. Lao silk material and designs - Lao women's formal wear is the pa seen which is often hand made. And here we see the detailed Lao silk design elements including the foot of her dress and her sash.